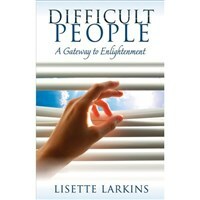 For most of us, difficult people are the bane of our existence. They annoy us, they throw us off balance, they test our patience, and—to one degree or another—they provoke reactions that are decidedly unhealthy. But it is also true that difficult people (DPs) mirror our own dysfunctional mental states and provide us with wonderful opportunities to understand ourselves, heal ourselves, and learn to live in the moment. After her initial surprise at being contacted by extraterrestrials, for more than three decades of contact experiences, Lisette Larkins has been implementing her ET mentors’ counsel. As a result, she lives a dream life in Malibu, California, training at Cross Fit, volunteering with her therapy dog Kelly, writing new books, speaking and lecturing on abundance creation, creating new projects, and enjoying a life filled with laughter, abundance, and joy. Look her up at www.LisetteLarkins.com. Little did I realize in July 2008, when I employed Lisette Larkins as my personal assistant, the many and incredible ways she would prove invaluable to my wife and my family and eventually change my way of thinking, or should I say, living. At that time, my wife, Jeannette, who had been diagnosed a few years earlier with early-onset dementia, or Alzheimer's disease (they are essentially indistinguishable), still insisted on driving her own car, despite my concerns and the concerns of her physicians and family. Although her cognitive facilities were impaired, she was still functional; i.e., she was able to dress and feed herself, converse, and play golf. She had trouble, however, paying bills and remembering appointments and kept asking repetitive questions--the signs of early dementia. So, Lisette's primary functions at first were to monitor the check paying, reconcile the check register, return phone calls, and arrange appointments for me and my wife; essentially to keep track of these household duties that my wife previously had been responsible for doing. Within months, Jeannette's disease took its course, and we had to take away the keys to the car, which created no end of destruction and distress for all concerned. Gradually, her functionality became further impaired, and Jeannette needed assistance with cooking, eating, getting dressed, and other routine tasks. Eventually Jeannette totally lost her ability to speak and swallow, leading to the need for a feeding tube and assistance in just about everything else. I soon became concerned for Lisette's own well-being, and the possibility of "burn out," resulting either in her own potential problems or her need to "flee" a difficult environment. I tried to alleviate the constant pressures of her dealing with Jeannette's deteroriating condition. For example, I offered to employ another assistant to help her and encouraged Lisette to take days off to "recharge her batteries." But she insisted that she was fine and that it was important to her to continue to deal with the situation on her own, without additional professional caregivers to relieve her and further complicate Jeannette's life. As difficult as it was to believe, Lisette genuinely seemed to be realistic when she would repeatedly respond with "no problem" to my every concern for her well-being. Even the most violent behavior by Jeannette; e.g., her temper tantrums and refusal to be fed through the G-tube, appeared to be "no problem" for Lisette. I started to question whether Lisette was really normal or was truly a "super person" of some sort. I kept thinking of the old saying, "If it appears too good to be true, it probably is." How could I ever replace her if she were to leave? What I didn't realize until I reviewed the draft of Lisette's book was exactly how she was able to turn a nightmare for any caregiver--dealing not only with long hours and an afflicted person's severe impairments and distress, but the agonizing emotions and worry of her whole family--into "no problem." As things worsened with Jeanette, due to her increasing impairment and need for 24/7 assistance, it seemed that Lisette got even calmer and was better able to respond to not only Jeannette's needs, but also the emotional well-being of other members of the family. When I started reading her manuscript, Difficult People: A Gateway to Enlightenment, it was as though a mental storm had come to an end; the clouds started clearing, the wind and rain stopped, and the sun started to shine through. I then realized how Lisette was able to perform at this high level, fulfilling not only the ever-increasing needs of Jeannette, but at the same time managing our residence and other properties and staying on top of other household duties, all the while quieting Jeannette's distress and discomfort. Until I persoanlly witnessed how Lisette was at peace and always happy, it would be an understatement to say that I would have been skeptical of concepts like "chronic well-being." Had I not had the opportunity to observe her in action every day, I would not have engaged in any discussion about "enlightenment," let alone agree to read a book about it. As a trial lawyer for many years, my professional life has focused on hard, concrete facts, persuading others that the facts and legal arguments I make are more credible than those argued by my adversaries. In almost every legal matter, as well as some personal matters, I approached things with an adversarial attitude. I believed that whoever said "winning isn't everything" must have been a loser. There was no second-place finisher in my life; just winners, and losers. I did not have the time or inclination to search my head or soul very often, or even contemplate the possibility that there could be a different approach to what I was thinking or who I was. In my world, not counting my family, there was only one person--me. I never thought about whether my mind was different from "me" or whether some part of my mind actually sought out and engaged with other competing minds. Reading Lisette's description of pathways to more enlightened living, and how to achieve a quieter and less chaotic and "noisy" mind, became fascinating and challenging. It is now clear to me how she is able to do all that she has done with Jeannette--and done it so well and peacefully. It is obvious that Lisette has truly mastered what she describes, and frankly she has changed how I look at and now respond to difficult people and situations. Because I am a practicing lawyer and my thought processes are grounded on evidence and logic, I face problems and challenges, meeting them "head-on." After reading what Lisette writes about so convincingly, and observing how effectively she uses her practice in real life, I'm convinced that many of the ideas are both credible and practical. Her description of nonreactivity may not be readily acceptable to everyone or may not seem achievable. But I certainly see it work for Lisette, and it is working for me now. As of this writing, Lisette is still Jeannette's full-time caregiver and manager of the household. As a result, Jeannette and I are very different and much better today, thanks to Lisette's enlightening way of living life. Lisette is convincing proof that what she writes about really works.